The holidays are upon us and the general consensus seems to be that they’ve somehow come around faster this year. No one knows how this happened but I have a feeling age might have something to do with it. If you’re holding out to score a last-minute airfare for Thanksgiving travel, you’ve probably waited too long. With the Wednesday before and the Sunday after this holiday being the busiest travel days of the year, all you can do now is bite the bullet. In which case, you might want to think about flying out on Thanksgiving morning to avoid the madness and the possibility of a slightly lower fare. While you’re at it, you may want to grab the book you’ve been meaning to read or load up your Kindle. The only thing worse than waiting in a long security line, being delayed at the airport, or being stuck in the middle of coach is not having a juicy piece of literature to help you escape. I don’t care what it is—from the New York Post to Proust—be sure you’re packing something to avoid getting sucked into a bad travel energy field. If you’re driving, fill her up the night before and, depending on your destination, check traffic reports before you hit the road so you have an alternate route plan. If you use a GPS, it can be difficult to reprogram a new route into it if you’re driving solo. Whether you’re traveling with a gang or alone, take the time to plan in advance to avoid any hassles or chance of road rage. And don’t forget the entertainment. Audio books make driving a pleasure. Depending on who your co-passengers are, it’s a unique way to experience a story together and it makes the time fly. I’d say anyone fortunate enough to travel by rail has it the easiest. It’s one of my favorite ways to go. Again, you can pack some snacks, reading materials, or just chill out to some good music and enjoy the view during the busiest time of the year without all the stress. Most importantly, don’t forget to adopt a Zen attitude. It’s busy, it’s nutty—it is what it is. You’re one of the fortunate souls who got an invitation and can gather around a table with friends or family to bicker with a crazy relative and celebrate with loved ones. Wherever you’re going and however you plan to get there, if you’re staying past the holiday, check out local happenings. Chances are that there’s something going on in or near the city or town you’re visiting that qualifies as an attraction. Even if it’s a nature walk or hike. Not that there’s anything wrong with it but family gathering typically entails a lot of eating and sitting in front of the TV. Use the opportunity of being away from home and treat it like a destination. Do a little research, you’ll be surprised with what you may find. Last but not least, thanks to everyone who takes the time to visit Ports Are Calling and for all of the support and ideas towards keeping it going. The web is full of shiny stuff that attracts your attention, so the fact that you read it means a lot. 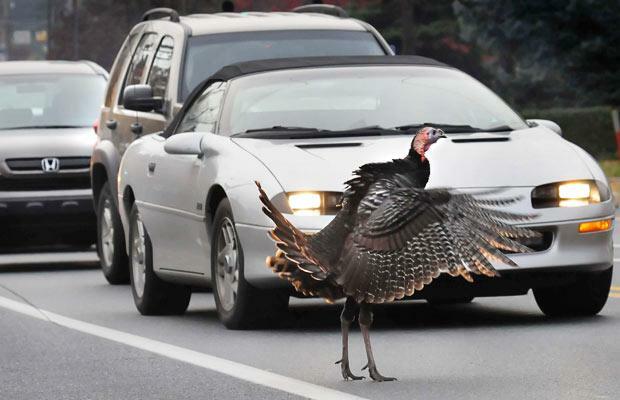 Be well, travel safe and enjoy a Happy Thanksgiving. This entry was posted in Uncategorized and tagged Air travel, alternate route, audio books, books, Daily Telegraph, GPS, highways, Kindle, literature, music, Reading, roads, Thanksgiving, Thanksgiving travel, traffic, train travel on November 25, 2013 by portsarecalling. Many Rivers To Cross With AmaWaterways. River cruising is becoming a preferred choice for vacations as travelers seek out new experiences. Hard to believe that the industry only emerged in 1992 after the completion of the Main-Danube Canal, making it possible for pretty much all of Europe to leverage its maritime landscape. While the Continent’s rivers had long been used for merchant trading, the completion of the Canal opened up new routes and provided the European travel industry with unique opportunities for travelers to experience this destination from an entirely different point of view. While American travel companies didn’t jump on board until around 10 years later, they quickly witnessed the rise of river cruising once they rolled out their ships. One of the lines making a name for itself on this side of the Atlantic is AmaWaterways, which operates voyages in Europe, Russia, Asia and Africa. For anyone who’s never been on a cruise or doesn’t like the idea of being on the open ocean, river cruising offers a unique opportunity to test the waters. 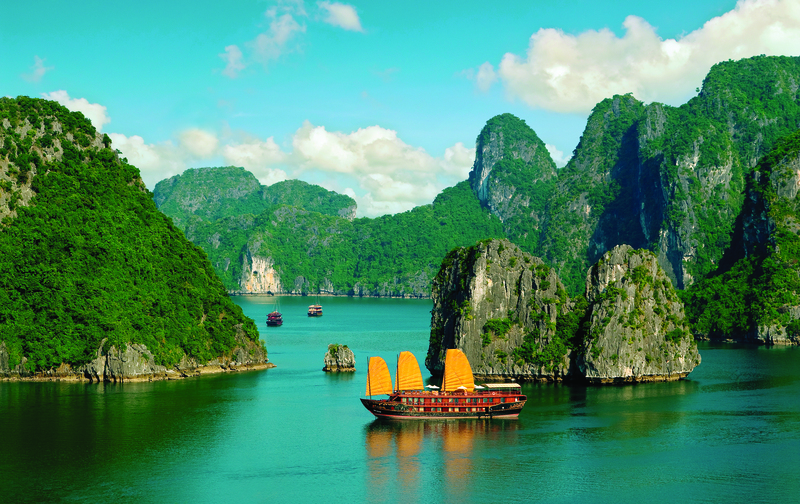 I had a chat with Gary Murphy, Vice President of Sales from AmaWaterways to learn more about its growing appeal. Q: For an industry that’s fairly young, you’re doing pretty well. What’s all the fuss? A: Over 90% of the folks who book with us are people who enjoy cruising but want a more intimate experience than on a gigantic ship. They love the feeling of going on a smaller boutique type of experience. Depending on the itinerary and ship, we max out at 162 guests. River cruising can be a very leisurely vacation or it can be extremely active. The ship is not the destination like it is on an ocean cruise. Q: What do you want people to know about this bird’s eye view? 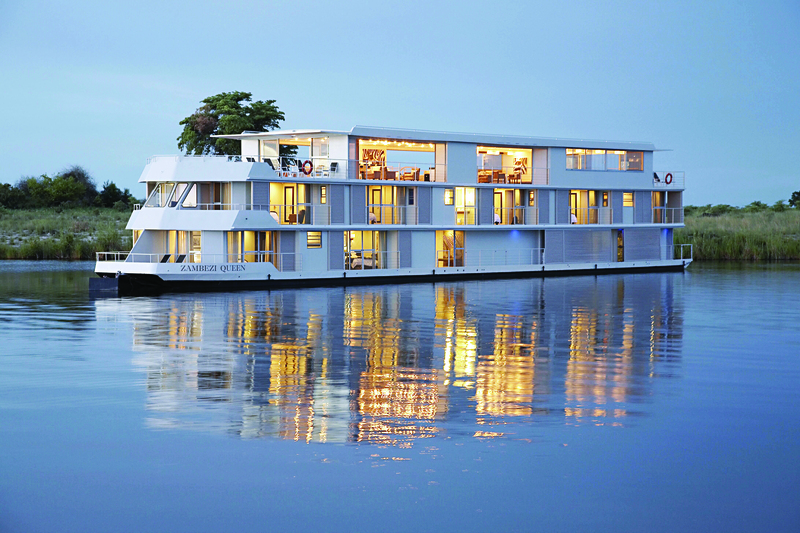 A: When you look at river cruising, you need to look at it like a floating hotel. Many cities in Europe evolved along the banks of major rivers and a river cruise can take you right to the historic center of those cities. Often, you’re asleep when the ship is en route to the next destination. If you’re going through central Europe on a motor coach or train, you’re traveling during the day. On the ship you wake up in a new town, go out and explore it, come back to the ship for lunch, then cruise to another town. There’s always something new to see. Q: What about those bikes on your European itineraries. A: We once had a group of six women who planted the seed for guided bike tours. They were on a cruise in the Netherlands and didn’t take the daily sightseeing tours with us – instead, they borrowed our bikes and planned out their own routes, cycling to the next port and meeting back up with the ship. They did all the research themselves, which was a bit of work for them. So we thought, let’s do this for our guests. Now on every European itinerary (except Portugal) we’re the only river cruise line that travels with over 25 bikes stored on the ship. They’re completely complimentary and guests love being able to explore on their own or take a guided bike tour. Q: So you’re giving it up for us gals here, right? A: It was a great idea and we’re happy to give those women full credit! Women like to bike and they don’t want to have to carry their luggage with them or have a van follow them. Many of our ships cruise along the Rhine or Danube, both of which have paved bike paths along the riverbanks, completely separate from the roads. On certain days you can ride ahead of the ship, going through small towns along the way, and meet the ship in the next port. If the ship is in port all day, you can borrow a bike and sightsee on your own, returning to the ship later that afternoon. On our guided bike tours we have two guides, one who rides in front with the fastest rider and one who rides in back with the slowest rider. They’re there to keep an eye on everything. Vineyards along Portugal’s Douro River. Q: What’s the most popular itinerary these days? A: The most popular cruise for the company is also the most popular cruise with women, Budapest to Nuremburg on the Danube. It’s a great itinerary with Vienna, Budapest, a pre/post stay in Prague, and pretty little towns like Durnstein and Melk. Another popular one is our Paris & Normandy cruise. France is commemorating the 70th anniversary of D-Day in 2014, and our Paris & Normandy itinerary includes some special excursions to the D-Day beaches. And we have a Knitting Cruise that sails over New Year’s in 2014, which is already 60% sold out. Q: I don’t knit but it might be a good excuse to learn. Who’s the inspiration behind these ideas? A: Kristin Karst, our Executive Vice President, is very creative, very active and she loves designing eclectic itineraries. For instance, she created a Chocolate Cruise where guests visit a castle, see how chocolates are made, and learn how to pair dark chocolate with red wine. Our culinary and wine tours are really popular. In Austria, guests on our wine cruises get to do a tasting of Sekt, the Austrian version of champagne, served inside a mountain cave outside the town of Schlumberger. Up close and personal in Normandy. Q: You’ve added a new destination in 2014 that’s long been closed to tourists. Tell me about Myanmar. A: It’s a niche market. We like going into destinations that are interesting to operate in. Our president, Rudi Schreiner, is a river cruising pioneer who loves going into new areas of business and designing ships that best serve that area. Our ships in Mekong are hands down the best ships there. Rudi is designing a ship for Myanmar, a beautiful small ship with only 28 suites. It’s the perfect size to operate on the Ayeyarwady River. Q: For all its popularity, there’s not a lot of advertising for river cruising. Why is that? A: We advertise in conjunction with retail travel agents and all of our business comes through them. We create a lot of educational tools for travel agents because it’s very important for them to understand our product and the exceptional value we offer. A good travel agent can point out the differences and benefits between competitors and help clients determine which river cruise is the best choice for them. 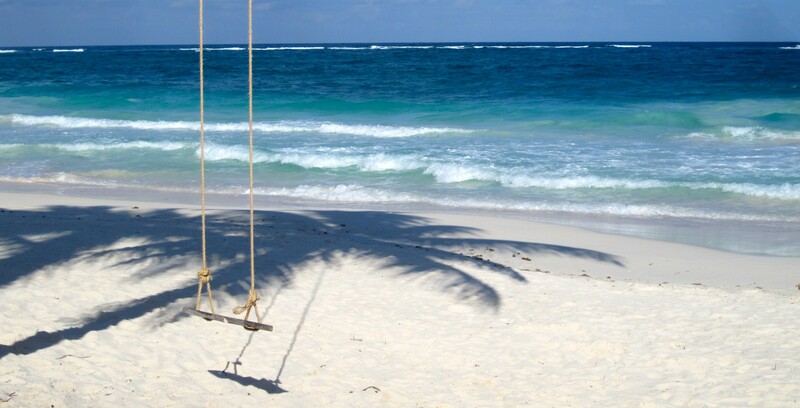 The best travel agents are the ones who know how to match their clients to the right product. Q: Younger people don’t typically cruise, are you seeing any changes there? A: We’re seeing them in multi-generational family travel because river cruising lends itself to that type of vacation experience. For instance, teenagers or active folks can bike, their parents can go on a culinary tour, the grandparents can go on a leisurely walking tour, and then you all meet back on board to share a meal and spend some time together as a family. Curious if a river cruise is the way to go? Learn more at AmaWaterways or speak with a travel agent. This entry was posted in Chats and tagged Africa, AMA Waterways, Asia, Austria, biking, Budapest, cabins, chocolate cruise, cruising, culinary cruise, Durnstein, Europe, Gary Murphy, Kristin Karst, Main-Danube Canal, Melk, multi-generational travel, Myanmar, Netherlands, Nuremburg, Prague, river cruising, Rudi Schreiner, Schlumberger, Sekt, The Danube, Travel, Travel Agents, vacations, wine cruise, women 40+ travel, women travelers on November 21, 2013 by portsarecalling. Tales from the Wadi Rum. “Hard to believe there’s a war going on next door,” said my travel companion. 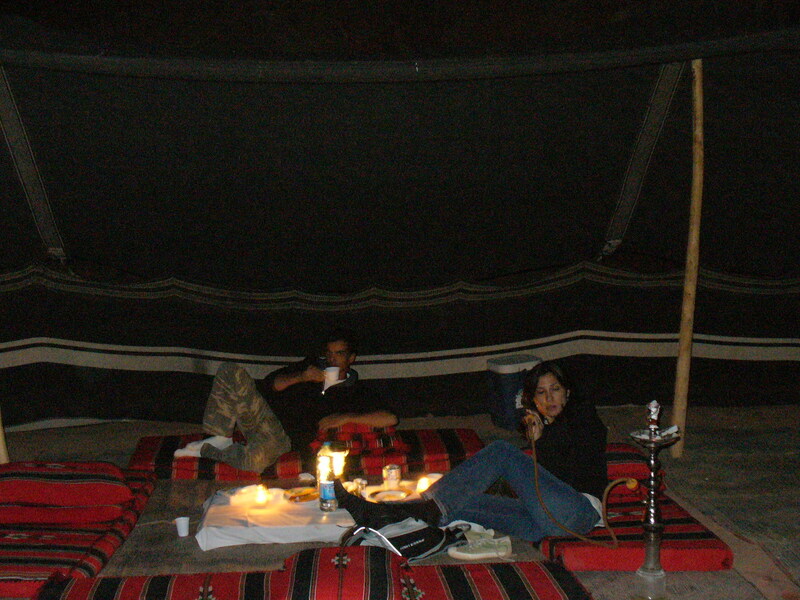 It was 2007 and we were sitting around a small campfire in the Wadi Rum desert. It was a trip we’d hooked on to an event I’d managed in Egypt. We’d chosen that country because we weren’t sure how many years would be left for Americans to travel there before it all went pear-shaped. After Egypt, the idea was to take advantage of being in the region so we set our sights on Jordan. Through shuttle arrangements we made our way into the desert and the land where Lawrence of Arabia was filmed. The Wadi Rum is otherworldly and we were happy to be there. 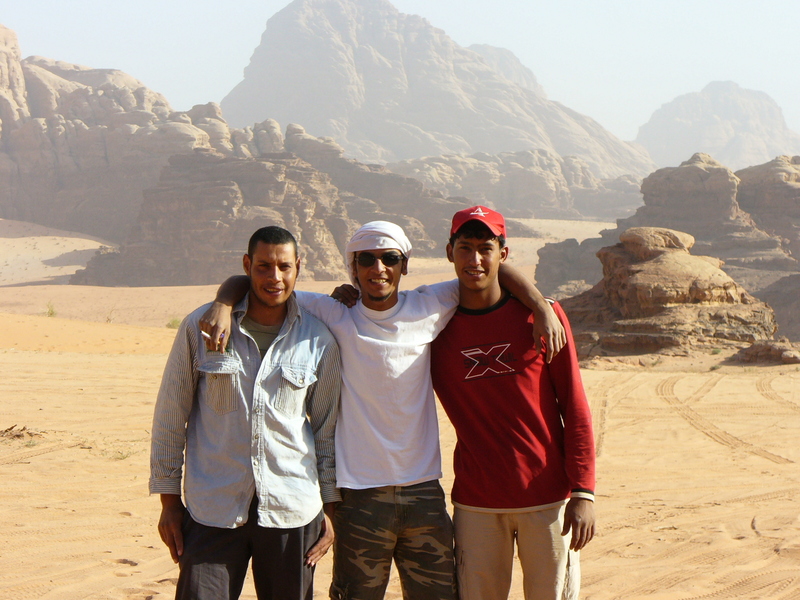 A handsome, young Jordanian guide, Ra’ed, met us along the Desert Highway. We hopped into his jeep, driven by a shy, Bedouin, teenage boy and within a few minutes were off-road, traveling through desert red sands. The world we knew disappeared, and aside from the clink and clank from his truck, there wasn’t another sound. We made out way through mountain rockscapes in various hues of crimson. There wasn’t a soul in sight and for this city girl, the empty space was liberating. 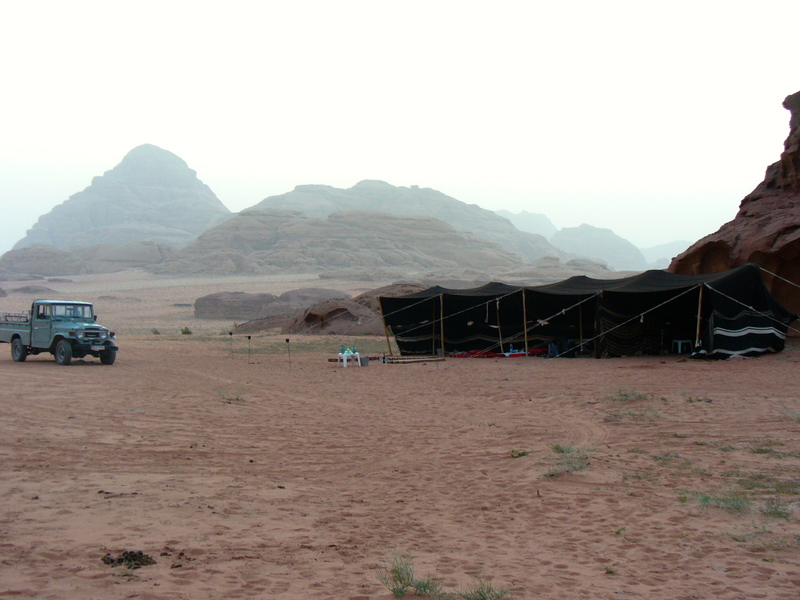 Eventually, a long rectangle Bedouin tent came into view and our driver swung a long arc around it and parked. We met the chef, an Egyptian, and then we proceeded to make ourselves at home. Out came the hookah pipe. I find the sweet smoke a bit nauseating but when in Rome, right? So we sat around and exchanged the typical questions like, “Where are you from?” and “Why did you come here?” but we made quick work of that superficial talk and dove deeper, seeing as it was just the five of us. A group of tourists who’d been in camp earlier in the week had kept to themselves and barely acknowledged them. Frankly, I don’t see how it would be possible to ignore the people who were responsible for getting you in and out of Wadi Rum, feeding you and providing you a tent for sleepy time. The chef smiled and excused himself because he had to get cooking. Back in the truck, Ra’ed took us through desert. We all raced up sand dunes and slid down them. Gazing around at its natural architecture, the Wadi Rum, also known as the Valley of the Moon, is hypnotic. The sunset reveals deeper shades of red on the rock walls. Not so easy as it seems. A few hours later, they laid out a banquet table decorated with candles and tray upon tray of food. There were falafel, stuffed grape leaves, couscous with raisins, salads, pita bread, dips of hummus and baba ghanoush, rice with lentils, platters of vegetables, and lots more. I couldn’t imagine how they thought two people could make a dent in it. Ra’ed told us to enjoy the meal. My boyfriend and I looked at each other and in unison said, “Where are you going?” He told us that they’d eat when we had finished. There was no way that was going to happen. We explained that it was extremely uncomfortable for us to dine without them and after much persuading they joined us. Stuffed and satisfied, we sat around on massive pillows, passed the pipe again and gazed at the stars and the shadows the mountains made across the dark sand. A full moon had risen and the chef suggested we build a fire. So we dragged our pillows into the sand around the pit he’d made. There we were, an American, a Brit, an Egyptian, a Bedouin, and a Jordanian. Through broken English, translated through Arabic and a mishmash of a few other languages thrown in, we all got on like a house on fire. There was lot of giggling, talk of what music we liked, and of what America is really like. We did indeed find it hard to believe that Iraq was next door and being made a mess of. Eventually, things got quiet until the silence was broken by the unmistakable sound of Bill Withers singing, “Ain’t no sunshine when she’s gone,” followed by Ra’ed giggling. It was the ring tone on his cell phone and he entertained us by playing it over and over. That night we slept in a pup tent they’d set up and made comfortable for us. The next morning we watched the sunrise bathe the desert mountains gold. Afterwards, we all shared a breakfast of tea, fruit, boiled eggs and biscuits. 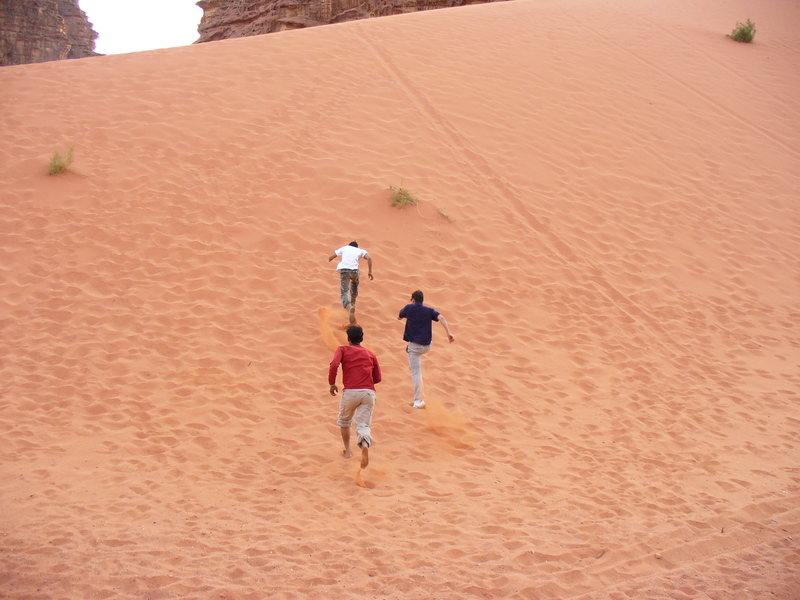 Then we hopped back in the jeep to explore, hike, and absorb as much of the Wadi Rum’s energy as possible. 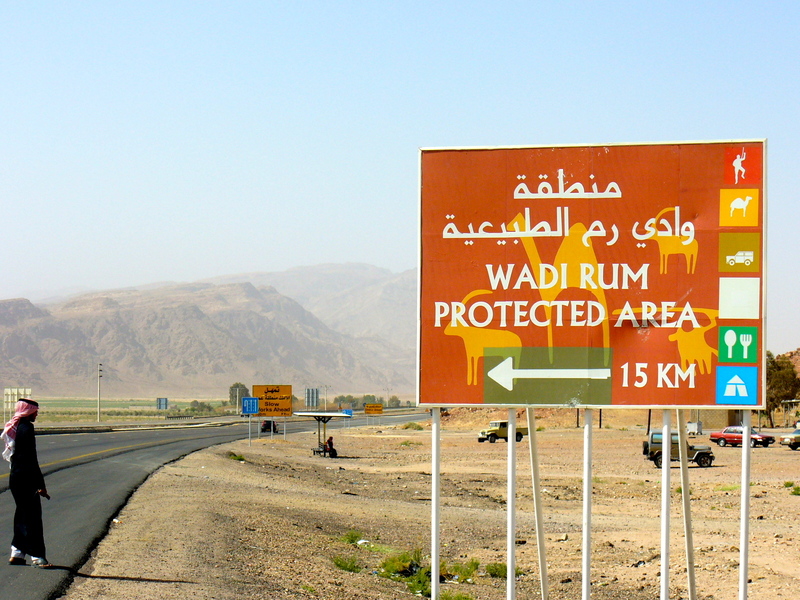 They let us take turns driving and we passed camels and a goat herder. Walking, I came across a small bouquet of delicate white flowers growing out of the sand and other small wonders. Back at the tent we took pictures, exchanged hugs and were sorry to leave our new friends but we were moving on to Petra, the Jordan Valley and the Dead Sea. Jordan remains a safe and attractive place to travel. The Bedouins, whose lives have changed over time, and the Jordanians are well-known for their hospitality and tourism contributes a huge percentage to the country’s GDP. Wadi Rum attracts visitors from around globe, yet despite its popularity its pleasure for me was the sweet feeling that it existed purely for my own experience. The new friends, and Bill Withers, were the icing on the cake. Got an itch to go somewhere? Go. And don’t forget to write. 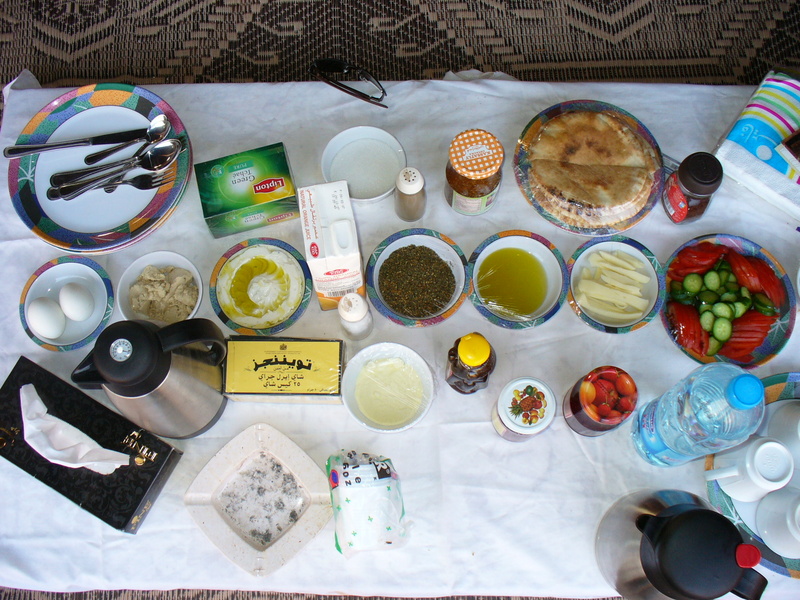 This entry was posted in Claudia's Trips, Uncategorized and tagged Bedouin, Bedouin tent, Bill Withers, desert, Egypt, Hospitality, Jordan, Lawrence of Arabia, outdoors, Petra, Rome, safety, tourism, Travel, Wadi Rum on November 14, 2013 by portsarecalling. Remembrance Day. Poppy Day. Armistice Day. Veteran’s Day. most would never care to tread. 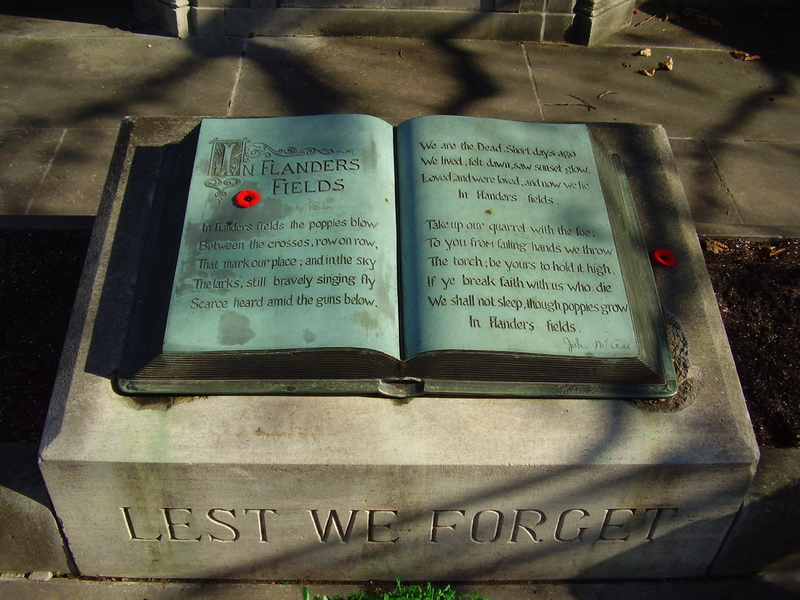 This entry was posted in Uncategorized and tagged armistice day, England, In Flanders Field, New York, Poppy Day, Remembrance Day, Remembrance Sunday, Veterans Day on November 11, 2013 by portsarecalling. 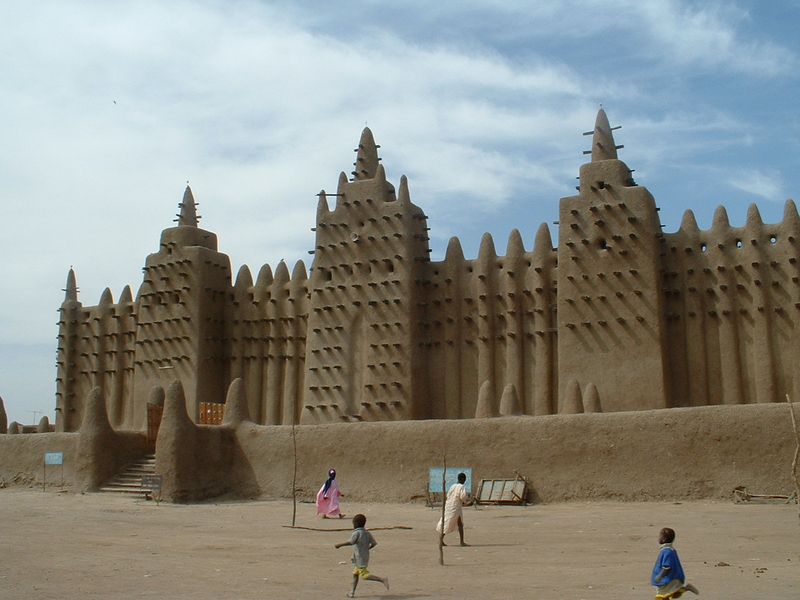 He traveled from here to Timbuktu and lots of other places. A particular piece of news caught my eye last week when I read about the death of William Haeseler III. For most people, the name probably doesn’t ring a bell. It didn’t ring a bell for me either but the fact that he spent his life traveling around the world did. The fact that he spent his career as a travel agent did, and the fact that he wrote about his travels in a weekly column got my attention. Except for obituary mentions, when I googled Mr. Haeseler he doesn’t show up anywhere. I looked for Mr. Haeseler on Facebook and on LinkedIn but didn’t find him there either. It’s possible he had a presence on those social media sites and that his profiles were pulled down quickly, but I don’t think so. What he did have was a presence in the travel industry. Along with his wife, he led tours to remote destinations like Antarctica and Timbuktu. You never hear of anyone going to Timbuktu. He also won National Geographic’s geography contest. The prize? Around-the-world vacations for him and his wife. Mr. Haeseler knew his stuff. Originally from North Tonawanda, NY, he traveled to over 150 countries. He even wrote a book, My Whole Life Was A Vacation. His weekly column, Globe Trotting, ran for more than 20 years in his local paper. This guy clearly lived and breathed travel and used his position as a travel agent as a platform to shout about it. That, I’m sure, generated a boatload of business for him within his local community and perhaps even further afield. No one told him it was part of his job, no one told him it wasn’t. I suppose it just seemed natural for him to share his experiences and love of places. It was a passion and when something becomes a passion it injects desire, discovery and inspiration into your personal and professional life and you want to share it. He died at 83. We could all learn a thing or two from Mr. Haeseler. Travel agents who toy around with writing about their experiences need to come out of the shadows. Be bold, take the first step, trip, fall, get up and do it all over again. Just keep at it, make it a habit. Sound your voice. It may or not be squeaky but the only way to know is to share it. It’s easy to cuddle up in the arms of resistance but it’s a dangerous place to live if you want to stay relevant in this ever-changing industry. Thank you Mr. Haeseler for your exploratory spirit on and off the page. Thank you for sharing and for showing us how it’s done. Read more about William Haeseler III. This entry was posted in Travel Agents, Uncategorized and tagged Antarctica, Business, Facebook, Globe Trotting, LinkedIn, My Whole Life Was A Vacation, National Geographic, New York, Timbuktu, Travel, travel agent, Travel Agents, travel writing, William Haeseler III, Writing on November 7, 2013 by portsarecalling.